Ms. Amporn Deebua (right), Banglamung secretary was head of registration for couples who went to register their marriage at the Banglamung office. 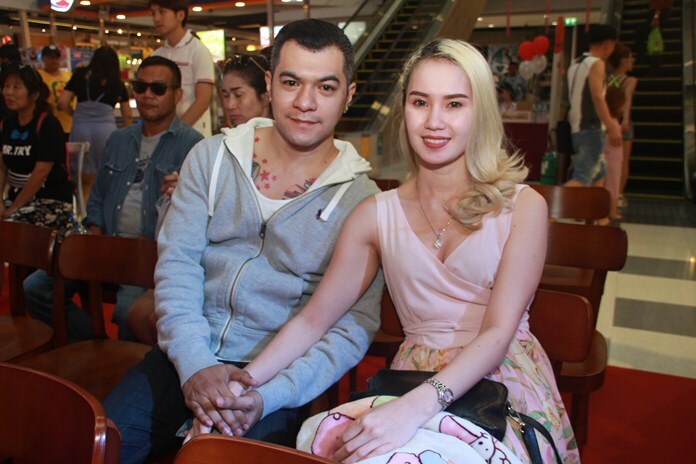 The language of love was being spoken everywhere in Pattaya on Valentine’s Day. 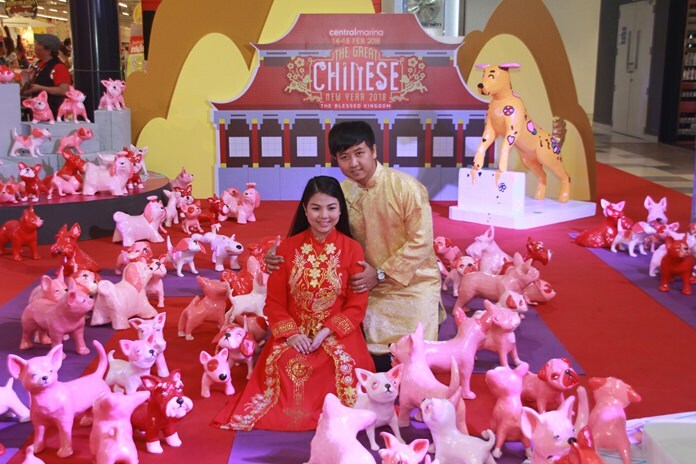 Whether it was red lanterns or red hearts, Pattaya’s hotels, stores and bars decorated lavishly. Central Marina and Central Festival Pattaya Beach were particularly packed with people shopping for their lovers. The malls also put on some special promotions, big discounts, giveaways and more for the retail lovers. 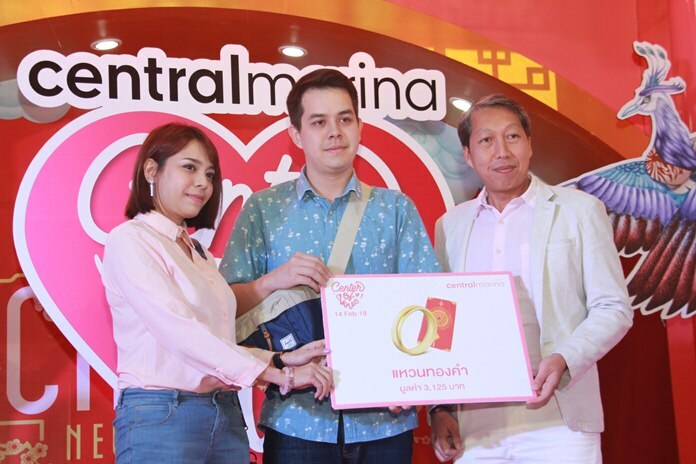 At Central Marina, five dinner vouchers at the romantic Centara Grand Mirage Beach Resort, worth 3,125 baht each, were the top prizes. Some people had more serious pursuit on their minds, however. 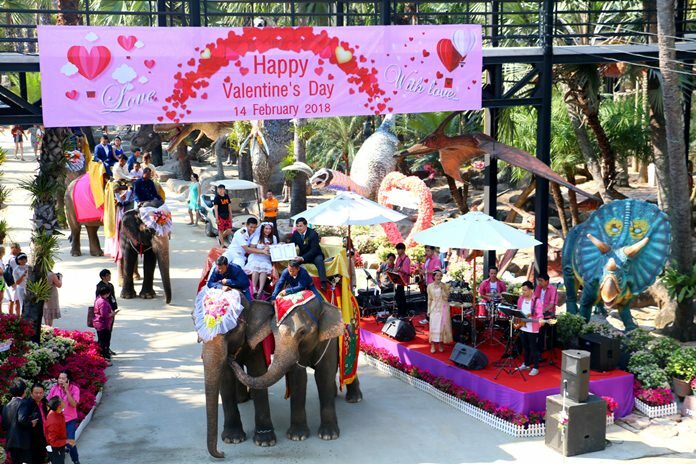 More than 100 people got married at the Banglamung District office while another 99 did so on the backs of elephants in Sattahip. 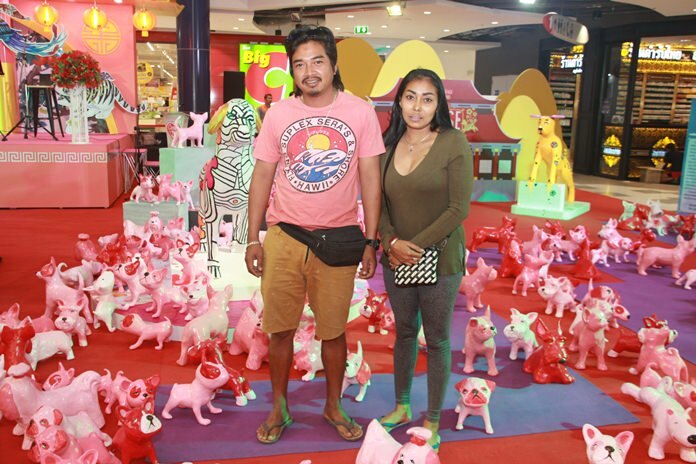 District Chief Naris Niramai­wong did the honors at the civil registration, wishing good luck to those who lined up before 9 a.m. and presenting each couple with teddy bears and heart-shaped pillows. In Sattahip, District Chief Pongphan Yomanart presided over registration for newlyweds on the back of elephants after tying the knot. 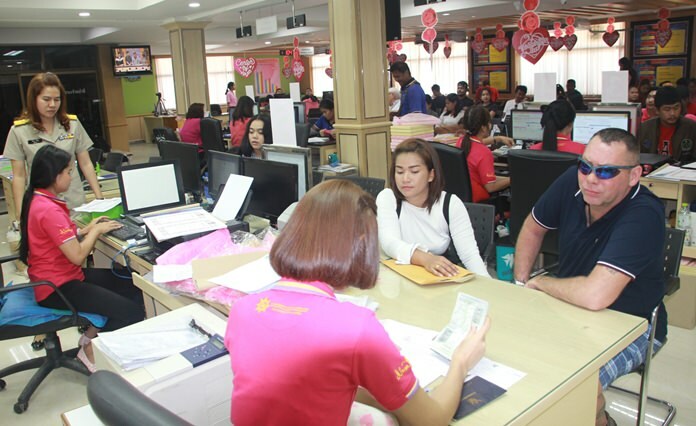 The Banglamung Administration Office was packed from 9am on Valentine’s Day. The service was punctuated by Thai traditional dancers and a band and all the couples received a wedding day dinner afterward. The younger set also got into the act, with Banglamung School organizing Teacher’s Day activities for Valentine’s Day. The idea was that youths should show love and appreciation to their instructors. Kwanchai Boonaree, GM of the Central Marina, gives away gift vouchers to these lucky winners for a romantic dinner. Teachers, meanwhile, gave red bows to the girls and awarded five youths with “outstanding student” awards. 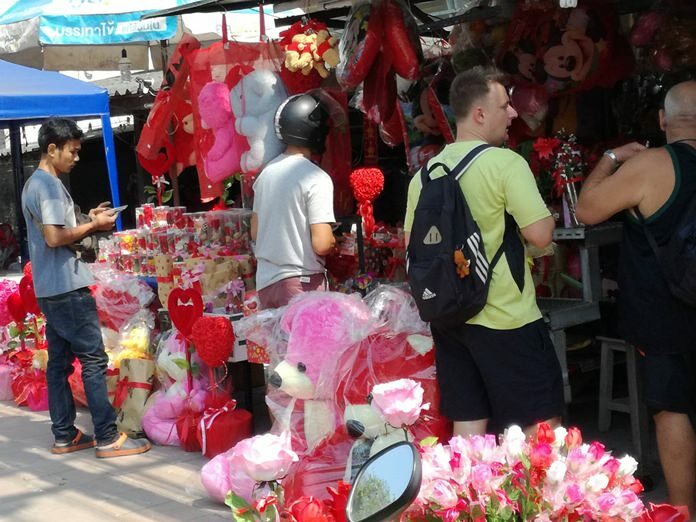 As always, Valentine’s Day proved a bonanza for Pattaya-area flower shops. Chanta Ohmsri, owner of a flower shop in Naklua, said roses were in such high demand she ran out before Feb. 14 ended. Her source is in Trat Province and this year white and red roses were the best-selling ones. Love is in their eyes. Another popular rose was the Chinese rose, which is slightly bigger than those grown in Thailand. They sell for about 100 baht while Thai roses sell for 70-80 baht. Apart from being sold individually, orders came in for banquets, a teddy bear and a heart with various sizes from 500-3,000 baht per order. 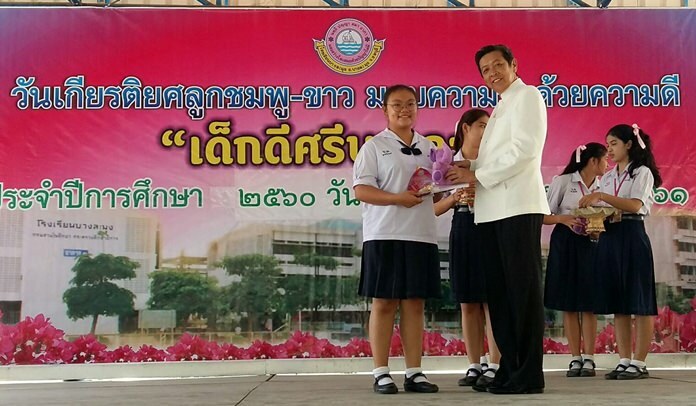 Banglamung School director Wisanu Pasomsap presents “outstanding student” awards to deserving kids. District Chief Pongphan Yomanart presides over registration for newlyweds on the back of elephants. Young lovers pose at Central Marina. Central Marina was a great place to take memorable Valentine’s Day photos. Naklua flower shops were doing great business. 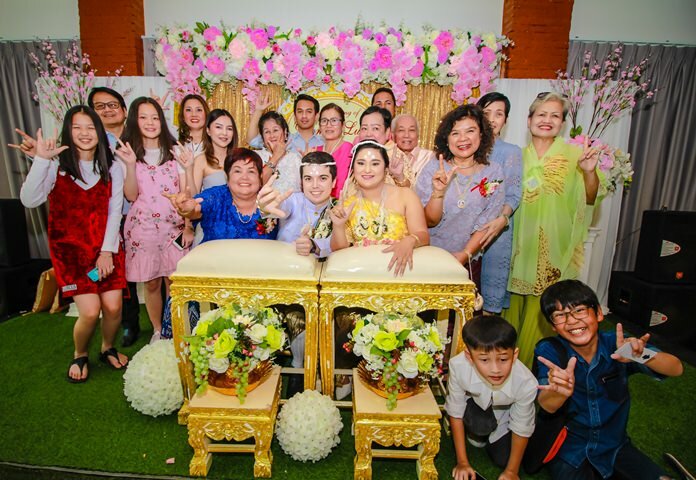 Italian couple, Luca Giacometti and Diana Pedroni chose Pattaya to have their wedding in a traditional Thai style. 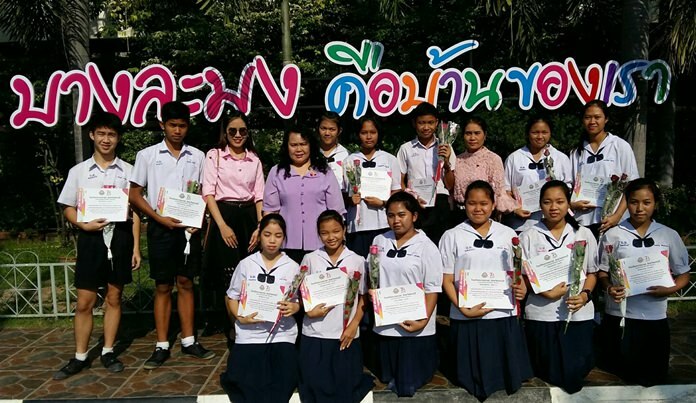 Students at Banglamung School proudly show off their certificates on Valentine’s Day.